Matt Damon says he’s happy his wife ? former bartender Luciana Barroso ? isn't a celebrity because he would hate to be part of a high-profile couple. 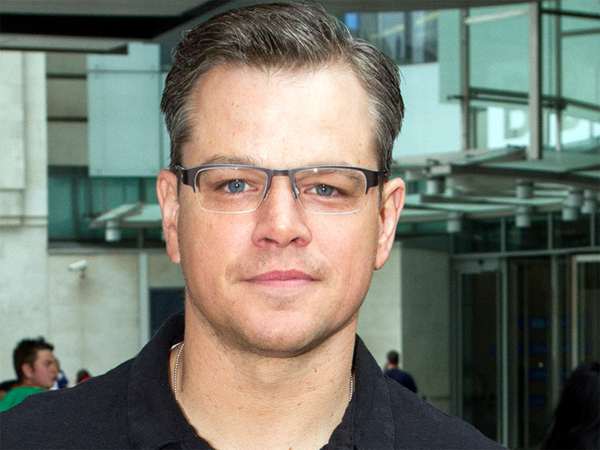 Matt Damon feels lucky to have fallen in love with a "civilian". The Promised Land actor married former bartender Luciana Barroso ? with whom he has four daughters ? seven years ago and Matt admitted he’s relieved he didn't fall for a fellow celebrity like his close friend Brad Pitt did with Angelina Jolie. He told the August issue of Esquire, "I got lucky. I fell in love with a civilian. Not an actress and not a famous actress at that. Because then the attention doesn't double ? it grows exponentially. "I look at Brad ? and I have for years ? and when I'm with him I see the intensity of that other side of it. And the paparazzi and the insane level of aggression they have and their willingness to break the law and invade his space. "Because he should be able to do that too. And he can't." Matt (42) also admitted he manages to avoid the paparazzi because he isn't very interesting. He explained, "If I'm not jumping up and down on a bar, or lighting something on fire, or cheating on my wife, there's not really any story to tell. "They can try to stake me out, but they're always going to get the same story ? middle-aged married guy with four kids."